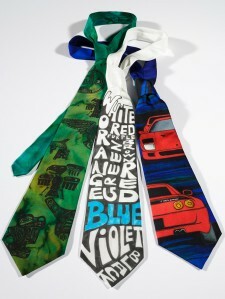 Classic style silk ties, ready to paint in white silk. We also have limited stocks of black ties which are ideal painted/stamped with metallic or opaque paints. Don't worry about undoing the ties and stretching them on a frame. Instead lay them on a sheet of polythene and paint, turning the tie as you need to. Fix as appropriate for the colours used. Ties can be dry-cleaned (depending on the products used) but we do not advise washing them.